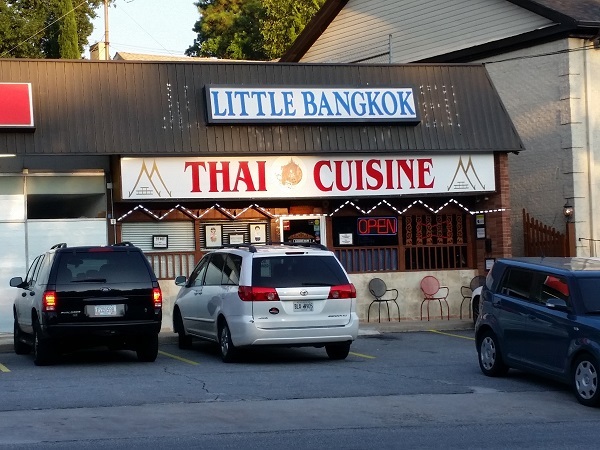 Little Bangkok, Atlanta GA – Marie, Let's Eat! Little Bangkok is a Thai restaurant on Cheshire Bridge Road, and it’s so little that you can’t help but bump into people here. For example, we arrived and bumped into our pal Val from A Scrumptious Life just as she was leaving! Marie and the boychild and I met our pals from Spatialdrift for supper here one evening last month. They’d been traveling all the heck over the continent – looking at glaciers in Canada, for starters – and Marie had been traveling all the heck over Atlanta canning and making salsa with friends, and when I suggested that Marie might like Thai for dinner, Emily had a pretty amazing shortlist of suggestions. Little Bangkok opened in 1994 and it’s been pretty packed ever since. The tip that I got from Independent Restaurant Review (link below) suggested parking across the street at the fabric store in the evenings. I’m not sure where you’re meant to park during lunch. Cross your fingers and have a plan B, I guess. 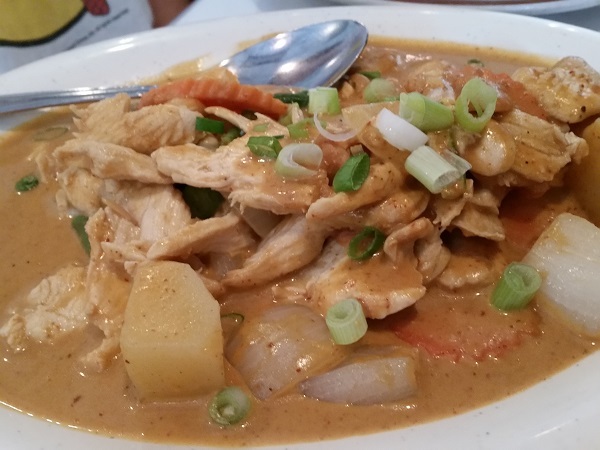 Over time, Marie has developed a go-to at Thai restaurants: masamam curry. It’s flavorful but mild enough that she should be able to share it with our four year-old monkey, if he were not being contrary and calling it too spicy. He just had some rice and was mostly well-behaved with it and acted like we’d taught him table manners. Then he grabbed a fistful and I closed my eyes and wished that I didn’t see that. Anyway, I was considering a tofu dish but something very interesting caught my eye: rainbow curry duck. I’d never heard of that before, and I rarely eat duck, so I gave that a try. 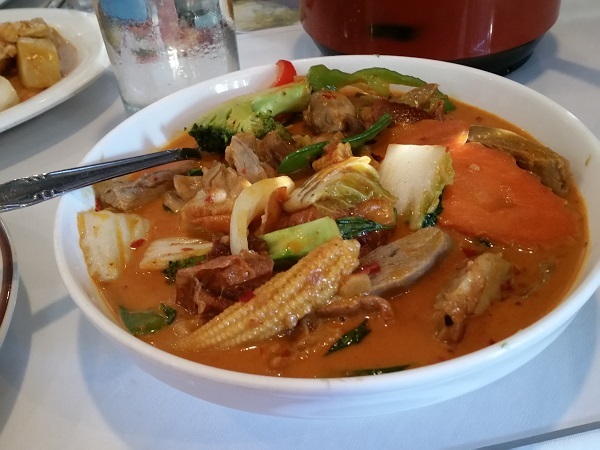 The menu described it as boneless duck in a “fine and spicy red curry sauce” with ten different vegetables. I enjoyed the dish and loved how all the flavors intertwined, but spicy it most definitely was not. I asked for it medium and it was far, far milder than I would have preferred. Actually, Marie’s masamam curry had more punch to it. One nibble and I had menu envy again. 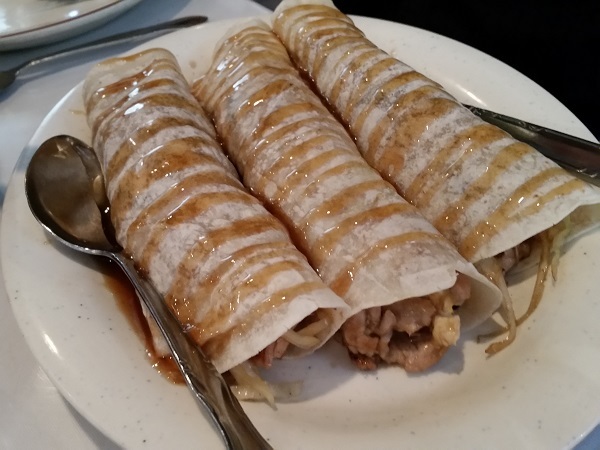 Adam ordered the moo shu pork, and this came served with a sweet glaze drizzled across the crepes. I haven’t ordered this myself in many, many years but I don’t remember it ever coming with a little syrup like that in whatever Happy-This-Golden-That restaurant in Athens that I would ask for it. And Emily had an order of Pad kee Mao, which are thick and wide rice noodles. The cousin of this dish, Pad see ew, is seen on the menus of most Thai restaurants, but this is a little harder to find. Emily says that she always orders it when she sees it, and enjoyed this place’s take. The restaurant serves both Thai and Chinese cuisine, as many do, of course, but I was a little surprised that a place that offers several unfamiliar-to-me Thai dishes offers such an old-feeling Chinese menu, full of General Tso’s and Moo Goo Gai Pan and the like. I suppose that the pages of menu devoted to Chinese food are really only here for that contrary member of the party who doesn’t want to venture out from comfort much, and while I wouldn’t mind another trip to this really popular restaurant at all, I can’t imagine even troubling that half of the menu when there are curries and Nam Sod and Nua Num Tok to sample. Posted on September 7, 2015 August 23, 2017 by Grant G.Posted in atlanta, georgia, thaiTagged atlanta, cheshire bridge, georgia, thai. My favorite is the Panang Chicken and the Tom Kai soup but don’t order them together as it is kind of the same flavor palate. They will make it hot but they have become so popular (sigh) that they probably have had to turn down the heat.